By Marvin D Feit, John S Wodarski, and Angelia M Paschal (Authors). What it’s like to be young, African-American, and a father. Voices of African-American Teen Fathers is an insightful look at adolescent pregnancy and parenthood through the eyes of fathers aged 14 to 19. This unique book features candid interviews with thirty teens who talk about “doing what I got to do”—handling their responsibilities as best they can given their perceptions, limitations, and life experiences. Teens talk about how and why they became fathers, how they handle being a parent, their perceptions of fatherhood, the relationships they have with their parents and the mothers of their children, and how they deal with the everyday struggles, demands, and concerns they face. Routledge (2006), English, <?xml:namespace prefix = o ns = "urn:schemas-microsoft-com:office:office" />Paperback: 246 pages. Nearly one million girls between the ages of 15 and 19 become pregnant each year in the United States and most of the available research on adolescent parenthood focused on them. We know little about African-American adolescent fathers or about their perspectives on the cultural and socioeconomic conditions that define their experience. 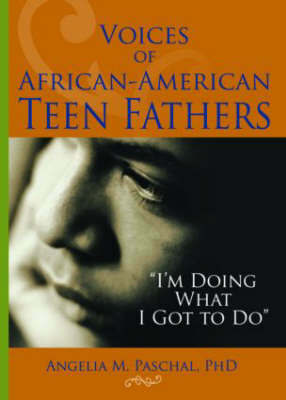 Voices of African-American Teen Fathers provides an understanding of these young fathers on their own terms and suggests theoretical frameworks, assessment tools, and effective interventions to develop a plan of action to help African-American adolescent fathers fulfill their roles. Helpful appendixes, including an interview guide and biographies of the particpants, are included, as are six tables that make complex information easy to access and understand.